The curtain-closer to Investec’s season came on a sunny evening at Shepherds Bush where the match - which came down to the penultimate over - was enjoyed by all. Radia sent his troops into bat first, hoping to post a good score and give Investec a difficult total to chase. Like the Australian Ashes top order batsmen, a few early wickets were thrown away with Cross and MacDonald both succumbing to the slow right arm of Hearn. The third wicket fell soon after in the 3rd over as the soft hands of Procter held a fizzing drive from McLoughlin, who had opened his batting display with a rasping drive through the covers for 4. In light of the shaky start, Bowie and Spencer slowed the pace down a little and started to build a respectable total with Bowie finding the gaps and consistently picking up 1s and 2s at will. Spencer didn’t quite get the conservative memo, preferring to take the tactic of 4 or nothing…however it was working. The fall of Spencer off the bowling of Da Costa prompted less aggressive batting from the middle order of Hymans as they looked to push the total over 100. Louw took a ‘3 for’ to dispatch most of the middle order of Hymans with his unorthodox action catching out batsmen Mongellaz, Pilley and O’Donnell. The young pairing of Fitzgerald and Dixie managed to clear up the tail enders Tann and Radia, with Hymans posting a respectable, but chase-able 121 – probably ruing a few cheap wickets. David Bowie’s 30 not was a certainly notable performance with the bat. Investec sent the dynamic duo, Messrs. Veal and Da Costa in to bat, hoping they would get some early runs on the board to chase down the target. That thinking didn’t last long with Da Costa getting caught second ball by Bowie off the bowling of MacDonald and Veal only remaining at the crease thanks to the “can’t be out first ball rule” after being excellently caught by Radia. 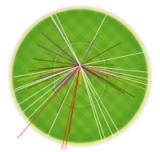 In came the South African big hitter Louw, who smashed a quick fire 28 from 11 balls before retiring from the innings. Once Veal had plodded his way to 27, Remnant and Patton, representing Investec’s female contingent, put on a lovely middle wicket stand with Remnant outshining a number of her male colleagues with a cultured 18, finally succumbing to the wily bowling of Buchanan. Lee and Procter hit some lovely shots to complete the chase with just an over to spare. The winning runs being a massive six down to long on from Procter. The game was played in a brilliant spirit and was one of the most entertaining games of the season with great camaraderie between the two teams. Unfortunately Hymans were unable to claw back any bragging rights in the boat race with the experienced Veal gulping Investec to victory.